The temperature is starting to drop and that usually means sickness is around the corner. My fiancé wasn’t feeling well this week so I decided to make him an updated Chicken “Noodle” Soup. Chicken Noodle Soup is always comforting when you are under the weather so it was nice to have a low carb version that we could enjoy. 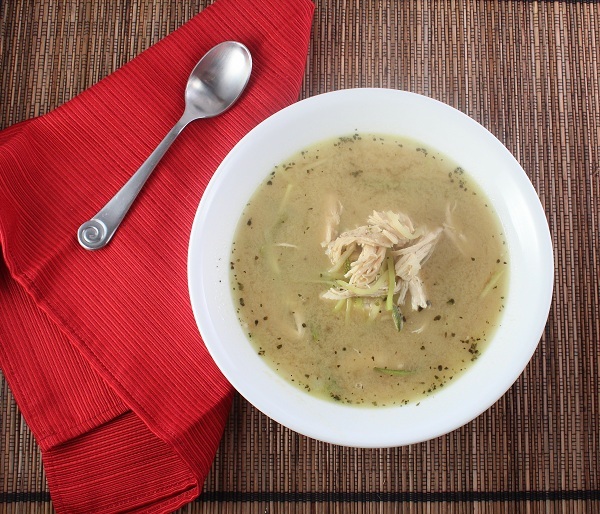 The soup was great for a weeknight meal because it’s ready for serving in no time. I didn’t add carrots or celery, but those would also be great additions to the soup. Heat 1 Tbsp of oil in a large soup pot over medium heat. Add the onions and cook for 5 minutes. Add the garlic and cook until the onions are tender and translucent. Add the Dijon mustard, stir to combine. Add the broth and bring it to a boil. Cut the zucchini noodles into 2″ strips (about three pieces per noodle). Add the zucchini to the broth and cook for 2-3 minutes or until the zucchini is tender. Add the chicken and heat through. Season with salt and pepper to taste. They don’t have the exact julienne peeler I use on Amazon, but this one is similar.